Tim Bray reviews the book of the year, Thomas Piketty’s Capital in the Twenty-First Century, and more importantly, rounds up the key reactions from around the Web. I’m very interested on the book, and I’m sure it will be on my “to read” list for a long time. BitCoin is one of those things I’ve found vaguely irritating since the beginning. Stross has a strong list of legitimate reasons to be irritated. Relatedly, this post by Jason Kuznicki explains why BitCoin is likely a speculative bubble. An observation by Yanis Varoufakis that has often struck me as well. It is worth noting, though, that in the social and political commentary of the 1950s and 1960s there is scant evidence of wealthy people complaining about their situation. They paid their taxes and went about their business. Perhaps they saw the logic of the government’s policy: There was a huge debt from World War II to be paid off, and interstates, public universities, and other public infrastructure projects to be built for the children of the baby boom. Or perhaps they were simply bashful. Wealth, after all, is as often the gift of good fortune as it is of design. For whatever reason, the wealthy of that era could have pushed for a world that more closely conformed to their self-interest and they chose not to. Today the wealthy have no such qualms. We have moved from a country of relative economic equality to a place where the gap between rich and poor is exceeded by only Singapore and Hong Kong. The rich have gone from being grateful for what they have to pushing for everything they can get. They have mastered the arts of whining and predation, without regard to logic or shame. From a piece that defies summarization on how a real estate developer purchased the New Jersey Nets NBA team as part of a plan to acquire and develop a coveted piece of prime real estate in Brooklyn. I strongly encourage you to read the whole thing. 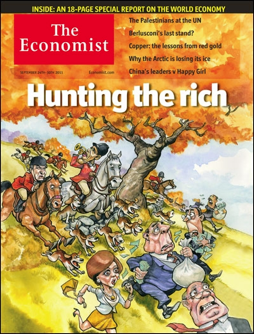 Last month Tim Bray reminded me that I should be reading The Economist. The thing I like best about The Economist as a publication is that its editorial stance is to be uniformly in favor of global economic growth. While I am certainly much more left wing than their usual reader or their editors, I am essentially in agreement with them that the number one priority of economic policy must be continued, long-term economic growth, even if I disagree with them on other priorities or occasionally on the best approach to creating sustainable growth. In any case, whether or not you agree with The Economist on anything, they are the best advocates out there for center-right, pro-business policy. Even if you disagree with their conclusions, their arguments are worth grappling with. Their policy prescription for dealing with the current jobs crisis and economic slowdown is straightforward — Western governments should pursue policies that prop up demand encourage job growth now and make binding commitments to address structural deficits later. This should sound familiar, because this has been the Obama administration’s position since President Obama took office. It’s also the position of nearly all economists who are not partisan hacks. And the truth is that if President Obama resigned tomorrow and House Speaker John Boehner took over, it would probably be his policy as well. … the human cost of the economic crisis is paid largely by those who are out of work, for joblessness increases depression, divorce, substance abuse and pretty much everything that can go wrong in a life. Worse, today’s joblessness is a particularly dangerous sort. A disproportionate share of those out of work are young, and youth unemployment leaves more scars, in terms of lower future wages and greater likelihood of future unemployment (see article). Joblessness is also becoming more chronic. In America, famous for its flexible labour market, the average jobless spell now lasts 40 weeks, up from 17 in 2007. In Italy half of those without work have been so for more than a year. Long-term unemployment is harder to cure, as people’s skills atrophy and they become detached from the workforce. Its shadow lingers, reducing future growth rates, damaging public finances and straining social order for years to come. People are looking to Belgium with envy because their lack of a government prevents them from pursuing pro-cyclical austerity measures that deepen the crisis. I thought that multinational organizations like the OECD and the G-20 were created in order to facilitate coordinated responses to global crises like the one we’re facing right now. Instead we’re seeing little collective action to turn the global economy around, and very little on the policy front from individual countries as well. In the meantime, things continue to slide downhill. Maybe this will work out, or maybe it will be a disaster. But it’s worth noting that absolutely nobody thinks it’s categorically absurd to think that what a firm needs to do to maximize long-term profits is boost spending over revenues. It’s an interesting way to take a jab at critics of economic stimulus. Update: Jason Kottke points out that Amazon.com operated at a loss for a long time before becoming the profit-generating machine that they are today.